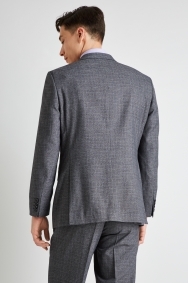 Stride into the office in this smart grey marl suit and you’re sure to turn a few heads. Crafted in a bold check, this jacket boasts the best of contemporary style and classic tailoring. 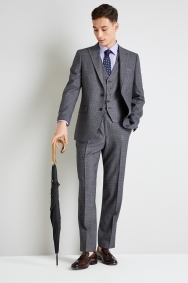 Single-breasted and with a neat two-button fastening, it also sports straight pockets, a full lining for comfort, and a unique peak lapel for added zing. Don’t shy away. 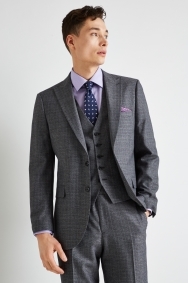 Complete the 3-piece suit look with a lilac textured shirt for colour. 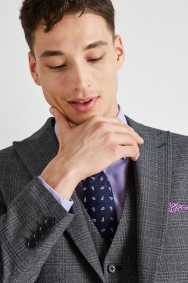 Accessorise with a navy and fuchsia paisley tie, and smooth brown tassel loafers. The hubby a 6' 2 and of big build fitted the jacket perfectly. His 44 chest size carried off the jacket well. The colour and pattern suited his blond looks rather well. 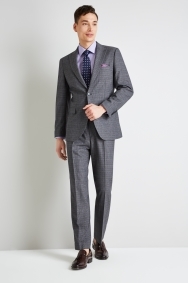 A great suit for board meetings or anything formal. Colour Did not match the online pictures. Good fit and well made. 50 inch chest fitted around the big stomach! Looks good. The quality seems decent. The sizes are correct. Good fit hangs well and looks good on. Good quality for the price and fits well. I'm regular 44 chest short which is the size I chose. The arms were approximately one inch too long for my liking and two inches for the correct look. I have this problem with all jackets.